The middle section is for the wood gas buffer to insure pyrolysis, not combustion. Marked the bottom of the can off into 8 equal sections. 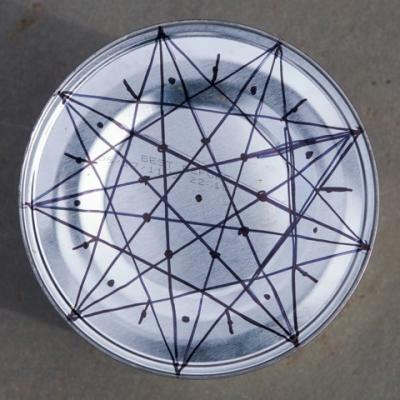 I then used a nail set to make 8 equally spaced holes about half way between the outside of the can and its center. I made a 9th hole in the center. Not too big -- about 1/2 way down the small nail set shaft. Then I used the line1/3 down from the top to locate the secondary air holes. I made 8 equally spaced holes with the small nail punch and then used the the biggest punch to enlarge the holes to the full width of its shaft. At this point I removed the top of the can completely. I left it on for the best structural integrity while I was punching holes. Done. The All-in-One TLUD is complete. Very simple. Just 17 holes in the right places in one can. There was a good showing of TLUD technology at the annual ETHOS Stoves conference in Kirkland, WA, USA on January 29-31, 2010. This report covers some of the discussions about TLUDs that took place at conference sessions. Dr. Paul Anderson, a.k.a., “Dr. TLUD”, made the pitch for TLUDs and biochar throughout the conference. He brought a large collection of 20 different TLUDs. Most were simple homemade devices made from “tincanium” (Dr. Anderson’s Friday evening presentation on the wonders of “tincanium” was delightfully humorous). TLUD designers Art Donnelly, Christa Roth, and Hugh McLaughlin all had stoves on display. Anderson had one example of a mass produced TLUD that is manufactured in India. * Applications: is the main focus on cooking, biochar, or a combination of both? * What are appropriate sizes? 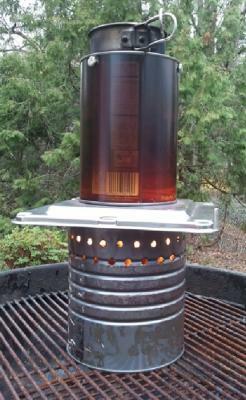 TLUDs exist for 2 cups, 2 liters, 5 l, 20 l up to 5 gallon, 20 gallon, 55 gallon. The interest in producing biochar is driving design of larger TLUDs. * What can we as individuals and organizations do to advance TLUD technology? * What are the future prospects of TLUD technology? * Lack of emissions robustness. More emissions on startup and sometimes on shut down. * Changing fuel form factor when adding new fuel can cause stalling. 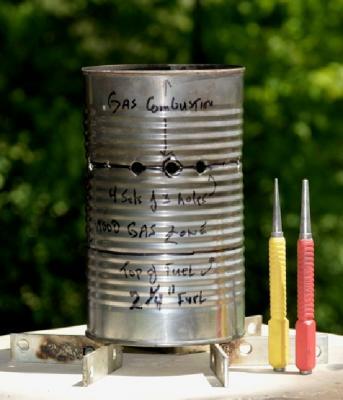 **Materials:** light-weight ceramics are not necessarily needed for insulation of the combustion chamber, unlike in a rocket stove, as for TLUDs the temperature in the fuel bed stays at ambient temperature until the pyrolysis front passes through. Then temperatures get higher. The open flames are not within the combustion chamber but above the fuel bed. The hottest parts of a TLUD stove are the concentrator disk and the bottom of the fire chamber, where the remaining charcoal might be burnt creating high temperatures (if the char is not dumped out and conserved for other use e.g. as biochar). Ceramics are cheap to fabricate, e.g. 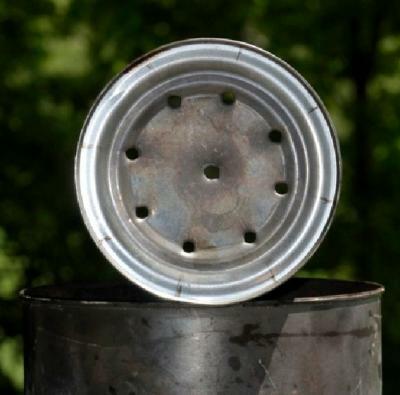 consumable stove components like the concentrator disk or the bottom plate of the fire chamber. 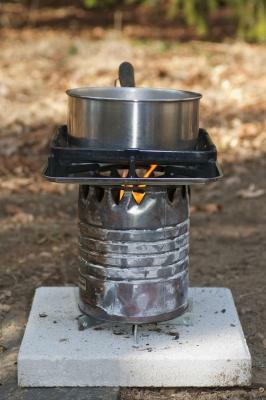 Options for modular stove designs containing ceramic parts to be explored further. A huge gap between standard pottery and industrial ceramics was noted. **Production and Dissemination:** Stoves should come as a kit: combustion chamber + pot stand/application + snuffer box for the char to be saved. **Modular advantages:** TLUDs excel on high power output, e.g. boiling water, but don’t turn down the power so well. The concept of having a different and/or smaller combustion unit for the simmering stage or replacing the continuous heat addition with a retained heat cooker should be explored further. 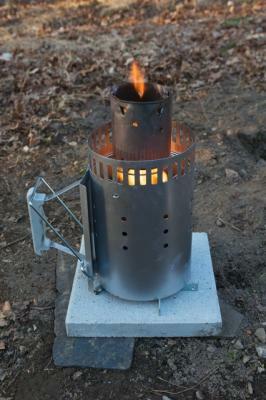 Modular systems could use a number of TLUD burners under a large pot or grill. If cooking lasts a long time, such as firing a grill at a restaurant, you could replace spent TLUDs with new ones to keep the heat going while you recharge spent TLUD’s with new fuel. * The BP Oorja stove, now called FirstEnergy, distributed 400,000 units in India, but there exists little feedback on the campaign. * Phillips had a TLUD stove and planned a major roll-out in India to start late 2009, but no up-to-date info is available. * Nathaniel Mulcahy of World Stove is manufacturing institutional and household size stoves in Haiti (uses a pyrolytic gasifier technology similar to TLUD); allegedly building over 100 units per day with plans to upscale and add a fuel production unit for grass pellets. This is a very interesting project in the limelight, with high potential to create worldwide awareness. To be observed. Other than those listed above, there are no projects yet at a major scale. Participants observed that this was a ‘chicken-and-egg’ scenario: Donors only want to roll out ‘already proven technologies’ but nobody apart from major companies like BP or Phillips has the money to do the research needed to prove the technologies. Funding is needed for research to get the combustion chamber to the application stage and to collect user feedback on a major scale. The group felt there was a strong need to get more experience on the ground building and cooking on TLUDs. In Uganda this year a TLUD-project with World Bank funding will start. Funding has been secured for 2 years. More projects are needed. * Cook on a TLUD. Several people have been making TLUDs, but very few have been cooking on them. Some people volunteered to use a TLUD for cooking for a given time, like a month, and blog about the experience. More volunteers are needed to do this. * Create awareness and knowledge about TLUDS. * Paul Anderson committed to put a TLUD handbook on the web. Upcoming TLUD events include a Combined Heat and Biochar event in Massachusetts on 9-13 August (contact Paul Anderson for more details) and the annual Stove Camp at Aprovecho, 26 to 30 July. Dean Still, organizer of the Aprovecho Stove Camp has said the camp will focus on the TLUD this year. Here I show the 4th can used in the P80 design. It is a 1 quart paint can. can acts to collect and focus the thermal energy in a 3" diameter column. 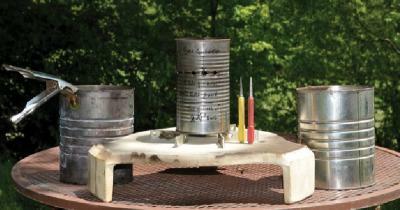 Can #1 is the 3 lbs Costco burn pot with 4 lbs of softwood pellets. support the "gas drip pan" and gas grate. relatively cool and help keep the heat in the system. The design of the two can Sweet 16 TLUD has evolved a bit. No more bricks. Added a focusing plate.